The M198 Howitzer provides the user with a towed system that is air transportable, has high reliability and availability while greatly increasing the effective range of towed weaponry. It provides significant improvements in lethality, range, reliability, availability, and rapid emplacement and movement over its predecessor, the M114A1, which was fielded in World War II. The M198 is air transportable by transport aircraft and the CH47C Helicopter. The weapon is designed for use with new ammunition, such as the Copperhead and rocket assisted projectiles, as well as other 155mm standard projectiles and propelling charges. The gun/ammo system complies with the quadrilateral (US, FRG, UK, Italy) ballistic standardization agreements. Features: The M198 Medium Towed Howitzer is a 155mm field artillery howitzer. It is constructed of aluminum and steel, and is capable of being airlifted by CH-47 or CH-53E helicopter, and airdropped by C-130 or larger fixed-wing aircraft. The M198 provides increased range, and improved reliability and maintainability over the former standard towed 155mm howitzer, the M114A2. The use of rocket-assisted projectiles significantly extends the range, lethality, and counterbattery fires of the direct support artillery battalions. The M198 fires all current and developmental 155mm ammunition. The howitzer is capable of 6400-mil operations with a maximum effective range of 30km. Background: The first 10 M198 Howitzers were delivered to the 10th Marine Regiment in January 1982. Even as work efforts toward acquiring a light weight 155mm Towed Howitzer continue, progress and improvements continue in support of the existing M198 155mm Medium Towed Howitzer. A look at past, present, and future logistics support in the field of artillery reveals the Product Improvement Program (PIP), the MPS Fleet Rotation Program, and the fielding of the RE 198 Recoil Exerciser. Past: The M198 PIP is a major system improvement with an overall objective of improving combat capabilities and reducing the probability of operator error. Additional benefits include: enhancement of the howitzer reliability, reduction in overall operation and maintenance (O&M) costs, and an increase in the system safety. PIP application began during the first quarter of 1995 and is scheduled for completion during the second quarter of 1997. Maintenance teams from the Maintenance Centers at Albany and Barstow conducted a "Road Show and traveled around the world installing the PIP kit on all active and reserve howitzers. The following provides a few of the modifications involved with the PIP: (1) The travel locking mechanism has been reinforced by wielding three support brackets to each gusset, which in turn results in fewer cracks and less stress on the clutch assembly and equilibrators, (2) the hydraulic pneumatic brake system has been fitted with pressure gauges that take the guess work out of making a good brake connection, reducing the number of brake lock-ups and providing more safety to the user, (3) internally, rubber booting have been placed on the U-joint connections going to the angular drive unit and the elevating screws, keeping contaminants from causing binding and wear, (4) and for the users convenience, lifting handles were installed at the ends of the trials to make it easier to place the 500lbs lunette weight into the truck pintle. To date, 97.3 percent of the Marine Corps Howitzers have been PIPd. The M198 is a true success story in every sense of the world. Present: The M198 MPS/Fleet Rotation Program is an ongoing project that will carry the Field Artillery Community into the twenty-first century, providing quality support to the users on two ends. This program affords the MARFORS users the opportunity to receive a one for one exchange of their M198 Howitzers with those being off loaded from the MPS. Until this program was instituted, the weapon systems off loaded from the MPS were sent back through the rebuild line in Barstow, California and then reloaded to the MPS. Now that the Rotation Program is in place, LOGBASES conducts "Joint LTI/Handoffs" with the fleet and Blount Island command allowing the MARFORS an opportunity to exchange their tired weapons for weapons that have seen little or no use, and ensuring consumer satisfaction with the rotating howitzers. Fleet weapons are then sent to the rebuild line, then loaded to the ships, providing the MPS with 100 percent mission capable equipment and the MARFORS with the same. Future: In the near future fleet artillery will be receiving the Recoil Exerciser. The RE 198 was designated to improve M198 reliability and reduce the probability of Recoil Mechanism failure in the howitzers that had not been fired for extended periods of time (in excess of ninety days). The RE 198 will also enhance howitzer reliability and reduce overall O&M costs. Most importantly, system safety is increased. 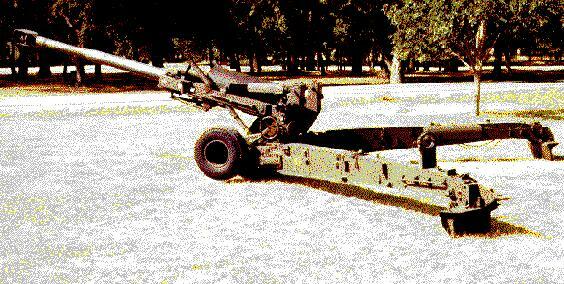 Due to the cost of training, the restrictions on firing, and other uncontrollable factors, the howitzers tend not to be fired as much as in the past. The Exerciser allows the user/maintainer a way of exercising the seals, pistons, and cylinders of the recoil during those times the weapon will go unused. This will reduce the stress on the recoil, the risk to personnel, lend more longevity to the recoil, and reduce the amount of time and money spent on maintenance. The Recoil Exerciser is installed by placing the yoke on the muzzle end of the tube, connecting the cables to the front lifting shackles, and connecting the electric pump to the yoke. The system exercises by pulling the tube into the recoil mechanism fourteen inches, and cycles three times. This prepares an unfired weapon for the sudden stress of a firing charge, which will in turn reduce the number of seal and cylinder failures. The RE 198 was designed by the Army for use by the Marine Corps. the Marine Corps Systems Command (MARCORSYSCOM) has procured sixty-eight systems. (Reference the MARCORSYSCOM (CBG) LOI of 27 Jun 96 for distribution to the MARFORS during the second quarter of 1997.